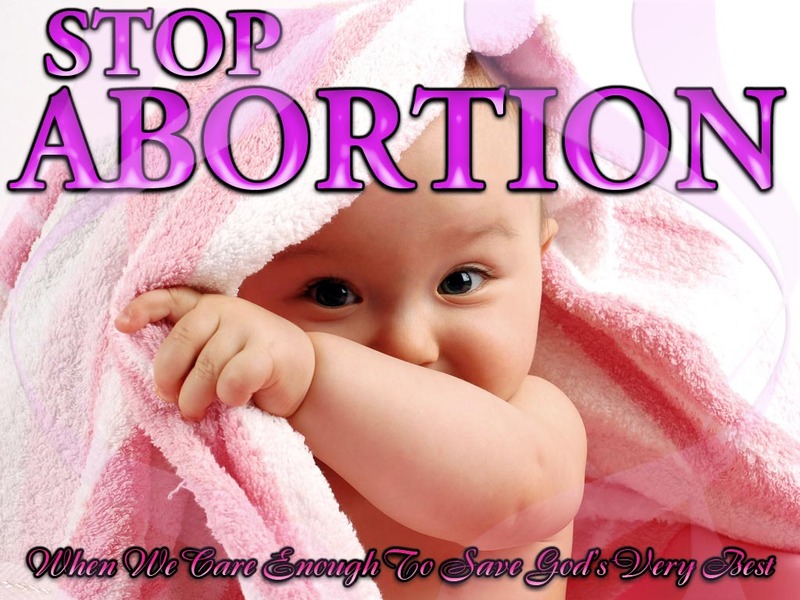 Over 50,000,000 babies lives have been snuffed out for the sake of convenience on American soil. The United States government not only allow it, they actively condone it, speak out in favor of it and take tax payers money to help fund it. The American people, though many are opposed to mothers paying to have someone destroy their babies in the womb, the majority sit in silence as the holocaust occurs. This is far from our only national sin, but I can think of none more violent, more despicable, more an affront to the heart of Almighty God, accept one. Two thousand years ago, the Son of God who came to this earth did no evil but only good, and people not unlike ourselves, were responsible for snuffing out his life upon a wooden cross. Today, people continue running around asking of the LORD..."God Bless America!, God Bless America!" Friends, He has already Blessed America and the entire world by sending us His Son...and we deny His Son, and we kill the children he gives us... or remain silent as it happens. While the scripture is true, "where sin abounds, grace does much more abound", we have to ask ourselves, for how much longer, because we know there is to come a day of reckoning. That day will come. It is past time to ask the Lord for more blessings until we accept the free gift He is offering today, the gift of Eternal Life through His Son. And perhaps it is also time for us to start asking God for His Mercy upon us, our children and our nation. Let us ask humbly on bended knee and contrite hearts for the souls of American's and all people, born and pre-born to know Yeshua, the Lord Jesus Christ, and from that will spring within us rivers of "living water", and our cups will fill to overflowing. Marleen Goldstein worked in a hospital that performed abortions. After 30 years, she’s come forward with her story. Goldstein was insulated from some of the horror of these abortion procedures. She did not actually witness the dead baby or the pain of the women going through contractions. Goldstein would later be promoted to a position where she would deal with the actual aborted babies. Other clinic workers have talked about how they were eased into the more difficult parts of their jobs in a similar way. They were started off doing things that were less emotionally difficult, such as record-keeping, receptionist duties or taking blood pressure, then gradually given more responsibilities until they were handling body parts or assisting in late-term abortions. By that time, they are “in too deep” and committed to their jobs. It is a way that some abortion clinics have been known to manipulate their workers. Despite her desperate efforts to get medical help for the child, the baby girl died. Goldstein quit her job, no longer an abortion supporter. This experience would change Goldstein’s life in another way when, several years later, she experienced a difficult pregnancy of her own. After a few years I got pregnant and went into labor at 20 weeks. The doctors wanted me to terminate immediately due to my health. They stated that this baby would not be normal and I should try again. I refused and was in the hospital, then was at home on complete bedrest. I was not allowed to be alone.. I finally spiked a very high fever and was rushed into the hospital. I was quite early still.. He was suppose to be born in November, I had him in July. - a 2 pound 10 ounce little boy. This was 30 years ago. I was told that he was quite small and it would be touch and go to see what would happen. They also told me, “Do not expect too much. “ He was in the ISU for preemies for sometime. He fought all the way and was perfectly normal. Today my son is a healthy young man. He is working on his 2nd Masters (MBA) and has a full time job. He is aware that he is lucky to be alive, cause if I did not have the experience I did early on, he would not be here today. Goldstein showed great courage in fighting for that little girl’s life 30 years ago. She also showed great courage fighting for her own son’s life. And, finally, she has shown great courage in sharing her story. As more clinic workers leave the abortion business and courageously step forward to tell their stories, more and more people who are uninformed about abortion are hearing the truth. We can hope that those who have been ambivalent or uncertain about abortion will be swayed when they learn what abortion is really like, coming straight from “the horse’s mouth”: those who experienced performing these abortions first hand. LifeNews.com Note: Sarah Terzo is a pro-life liberal who runs ClinicQuotes.com, a web site devoted to exposing the abortion industry. She is a member of the pro-life groups PLAGAL and Secular Pro-Life. Like this pro-life news article? Please support LifeNews with a donation during our April fundraising campaign!